2nd alarm New Haven, CT 27 Elizabeth St.
01/07/19 New Haven, CT - Multiple calls and companies reporting they could see it let firefighters know they had work. 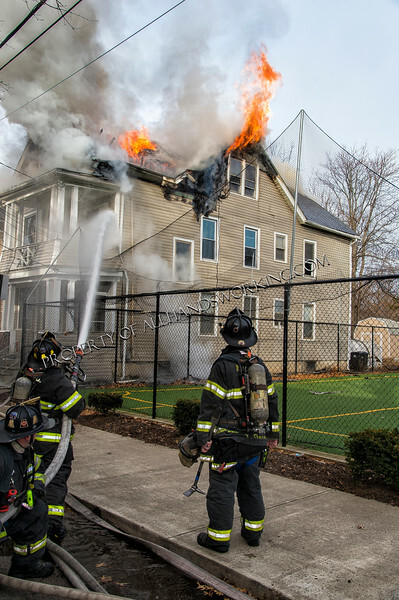 Firefighters had heavy smoke and fire on two floors of this two and a half story, private dwelling, located in the Newhallville section of the city. Companies had to overcome brief water issues as the fire quickly traveled throughout the second and third floors. They had to be briefly backed out of the dwelling as heavy fire erupted through the roof. A two and a half hand line was employed to darken down the fire. Firefighters were able to regroup and go interior stretching multiple lines to both floors. The fire took about an hour to bring under control. One firefighter was assisted from the dwelling with unknown minor injuries. The Red Cross assisted with relocating four adults and four children who were left without a home. The cause of the fire is unknown and being investigated.